9 startups were shortlisted who received one-on-one mentorship from sector experts and further pitched their businesses to a select panel of judges at the TiE Eduthon 2017. Next step: 3 winners to pitch for up to INR 3 crore in investment. 05 December 2017, Bengaluru: Unitus Ventures (formerly Unitus Seed Fund), India’s leading impact venture fund investing in early-stage startups innovating for the masses, TiE Bangalore and Sylvant Advisors, a leading education & edtech focused early-stage angel & seed investment entity, today announced the winners of the fifth edition of StartEdu – a nationwide programme that seeks to identify and invest in the best early-stage education and edtech startups. The three winners are Indigo Learn Edu Tech Pvt. Ltd., 23.4 Degrees Education Services Pvt. Ltd. and Mindchamp Teaching Solutions. The winners will now pitch to Unitus Ventures (formerly Unitus Seed Fund) for investments of up to INR 3 crores. “The experience of interacting with doyens of India’s Ed-tech space and fellow start-ups who are working on some path breaking ideas, at the TiE Eduthon & StartEdu was truly an immersive experience. The critical feedback and honest assessment by the jury helped us sharpen our axe,” said Sriram Somayajula, Founder of IndigoLearn. The fifth edition of StartEdu witnessed over 220 startups applying and 9 startups were shortlisted who received one-on-one mentorship from sector experts and further pitched their businesses to a select panel of judges at the recently concluded TiE Eduthon 2017. The judges for StartEdu 5 included a strong 8-member panel team – Parag Dhol, Managing Director at Inventus Capital, Ragini Chaudhary, CEO India at Gray Matters Capital, Sahil Kini, Principal at Aspada Investment Advisors, Anoop Polavaram, Operating Partner at Aspada Investment Advisors, Mekin Maheshwari, Founder at Udhyam, Mukul Agarwal, Cofounder and CEO at eTutorWorld, Klass Oskam, Managing Director at Signal Hill Capital and Srikanth Iyer, Venture Partner at Unitus Ventures (formerly Unitus Seed Fund). “Given the ‘fundamental’ deficit at every stage of education in our country, I am amazed that a large, credible EdTech company has not been created yet. I am hopeful that some of the finalists of StartEdu and TiE Eduthon can set that right,” said Parag Dhol, Managing Director at Inventus Capital. “StartEdu and TiE Eduthon brought together a good set of education entrepreneurs and investors. The quality of some of the startups were excellent. The open culture allowed for differing views from experienced investors to be expressed – enabling thought and debate. There were signs of potential collaboration- which is much needed in the sector,” said Mekin Maheshwari, Founder at Udhyam. IndigoLearn is India’s first digital learning startup focusing on finance and accounting domains, right from K-12 to Global Professional Courses. It aims to make learning as enjoyable as movies & games, with the power of stories, animated byte-sized videos, gamified assessments and personalized analytics. With its students first approach IndigoLearn aspires to make quality education affordable and accessible. 23.4 Degrees Education Services Pvt. Ltd. designs tools to improve the productivity and effectiveness of teachers leading to improved learning outcomes. Mindchamp Teaching Solutions is enabling and empowering the next generation of coders through activity-based learning in its micro-franchisees across India. It currently has more than 15 centers and has achieved over 2000 hours of learning. “TiE Eduthon and StartEdu put together a good set of entrepreneurs with novel products that have the potential to improve quality of education in India. However, we need to see more such edtech startups solving problems for the stakeholder and not trying to force fit their product into the classroom. Only then, will we see the big breakthrough in education that has been evidently lacking so far,” said Srikanth Iyer, Venture Partner, Unitus Ventures (formerly Unitus Seed Fund). Ethnus Technologies is an online platform connecting job aspirants to relevant industry experts. Gradufund is an education platform-based marketplace solution offering curated career guidance resources and financial connects to solve students’ needs. Learnix Edutech Pvt. Ltd’s Aptence is a mental aptitude development platform designed to enhance math and verbal skills among school students. RoadToNaukri.com is a web platform combining assessments, skill development and job placements for job seekers. SchoolAtlas’ Teacher Mitra is an android platform enabling early childhood educators to improve student learning outcomes by providing quality curriculum and customised teacher training. Bookmytrainings.com is a training marketplace that provides a platform to help individuals discover, evaluate and choose right course for improving their knowledge and skills. 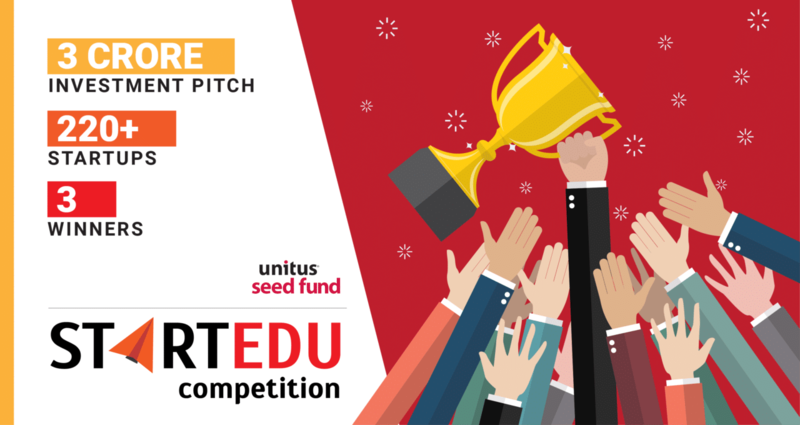 Started in 2014, StartEdu has so far received applications from more than 800 education startups across India. The 2015 winner, LabInApp, is a 3D simulation-based, curriculum-mapped interactive software solution for K-12 in India that runs on low-cost Android tablets as well as on Windows desktops and notebooks. Currently, more than 20, 000 classrooms are using LabInApp’s software. Unitus Ventures (formerly Unitus Seed Fund) is the leading impact venture fund investing in startups innovating for the masses in India in healthcare, education and fintech. Founded in 2012, Unitus Ventures (formerly Unitus Seed Fund) is managed by Capria Ventures which is part of the Unitus Group, a premier financial services group operating in India and other emerging markets since 2000. Unitus Ventures (formerly Unitus Seed Fund) is based in Bangalore and Seattle, and is a member of the Capria Network.